A woman was killed by flying debris in Toronto Monday night as officials warned Canadians to prepare themselves for wetter and windier weather due to the remnants of post-tropical cyclone Sandy. Police confirmed the unidentified woman was struck by an airborne sign at a parking lot near Keele Street and St. Clair Avenue at about 7:20 p.m. She was pronounced dead at the scene. The sign broke loose from a Staples store amid strong winds estimated to be about 65 km/h. The effects of Sandy extend over 1,000 kilometres, according to the Canadian Hurricane Centre, with southern Ontario and Quebec experiencing high wind gusts and periods of heavy rain on Monday night. Forecasters are predicting that winds could climb beyond 100 km/h overnight into Tuesday and officials are urging those in the storm's path to be prepared to last 72 hours without power. Some areas of the country could see more than 50 millimetres of rain. The storm could spawn the most widespread weather emergency since the ice storm of 1998, according to the Canadian Red Cross. The agency has 550 volunteers on standby in Ontario and the Atlantic provinces, said John Byrne, director general of disaster management for the Red Cross. Forecasters were predicting that residents in central and eastern Canada would wake up to intense weather Tuesday morning. Southern Ontario and Quebec are expected to see the strongest winds and between 30 to 50 mm of rain, while the Atlantic provinces will see weaker winds but a lot more rain — up to 100 mm. The storm is moving up the U.S. Eastern Seaboard, and made landfall in southern New Jersey around 8 p.m. It has already caused the cancellation of hundreds of flights to and from Eastern Canada. At Toronto's Pearson International Airport, one-quarter of all departing flights were cancelled. Storm surge warnings were also issued for Quebec, near the mouth of the St. Lawrence and the Gaspé Peninsula. Parts of Ontario and western Quebec might even see snow Tuesday. The Canadian Hurricane Centre says parts of southern Ontario should brace for 90 km/h winds or higher, especially along western Lake Ontario, the Niagara Escarpment, Lake Huron and Georgian Bay. Ornge air ambulances were grounded Monday due to the weather. CBC meteorologist Jay Scotland said the southern shores of the Great Lakes will see the risk of pounding waves and some shoreline flooding. "If you're in the Niagara Region [or] if you're south of [Lake] Huron towards Sarnia, northerly winds will be piling that water up on shore," Scotland said. "Avoid being near the shore. The waves are fun to look at, but you'll be doing a dangerous thing to take in those sights." Strong winds with gusts exceeding 90 km/h could also batter parts of Quebec. The force of the winds could uproot trees, said Environment Canada meteorologist Etienne Gregoire. Gusts up to 80 km/h are expected along coastal areas of southwestern Nova Scotia, with slightly lower winds expected farther to the north and east, the weather agency said. Other Atlantic provinces will also experience some rainfall and strong winds, as well as large waves and pounding surf. 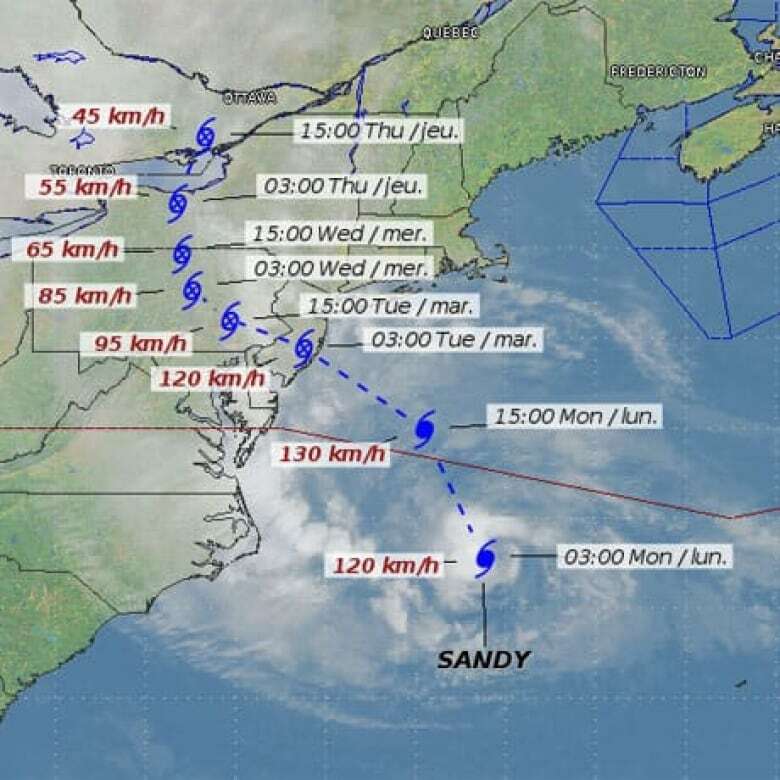 "We have forecast offshore winds to reach probably 120 km/h … and seas will be building west of Nova Scotia, in the Gulf of Maine and at the mouth also of the Bay of Fundy," said forecaster Jean-Marc Couturier at the Canadian Hurricane Centre. "We would be expecting probably wave heights to reach five [to] six metres in that area." Southwestern New Brunswick should expect up to 40 mm of rain tomorrow and up to 80 mm over the next couple of days, Couturier said. What makes Sandy different from other storms is its sheer size. "Usually a tropical storm system is a bit more compact than this and it doesn't affect quite as large an area," said Canadian Hurricane Centre spokesman Bob Robichaud. "This particular system is going to affect everywhere from southern Ontario, even into northern Ontario, and all the way to the Maritimes." The Canadian Red Cross issued a statement Sunday urging people to prepare for the storm by stocking a number of supplies including water, food, flashlights and a first aid kit. Sandy could down trees and power lines and cause flooding, the organization said. "Be prepared to take care of yourself and your family for at least 72 hours in an emergency," Mike Morton, the Canadian Red Cross director of disaster management in Ontario, said in a release. "By taking some time now to store emergency food, water and other supplies, you can provide for your entire family during a power outage or evacuation." Canada’s Public Safety Minister Vic Toews issued a statement saying the federal government is monitoring Sandy through the Government Operations Centre and the Canadian Hurricane Centre. He said Public Safety Canada is working closely with provincial agencies and urged those in potentially affected areas to check the website getprepared.gc.ca and have an emergency plan in place. Four litres of water per person for each day of a 72-hour period (two litres for drinking, and two litres for washing). Enough non-perishable or canned food for each person for 72 hours, as well as enough food for pets. A crank or battery-operated flashlight, with extra batteries. A crank or battery-operated radio, with extra batteries. Spare keys for the house and car. Cash in small bills, in case power outages restrict the use of bank machines. Other special needs items such as medications, baby formula, diapers and equipment for people with disabilities. "We have taken precautionary steps to ensure that the federal government can aid the provinces affected, should the need arise. The Canadian Forces and the Canadian Coast Guard are standing by ready to assist, Health Canada is conducting generator checks and has reviewed the National Emergency Stockpile and the Government Operations Centre is working around the clock to ensure all necessary assets are in place." People living in the affected areas are also being asked to refrain from storing anything that could become airborne outside of their homes. Emergency Management Ontario said objects that can be blown away, such as garbage lids, outdoor furniture and Halloween decorations, should be brought inside or secured. "Our primary goal at this point is to make sure that everybody understands that this is going to be a serious storm and that they have a part to play, so they need to be thinking about making sure that anything that's outside is secured or taken in," said Allison Stuart, the chief of Emergency Management Ontario. Porter Airlines said it has cancelled all of its Toronto flights until noon Tuesday. Air Canada and WestJet have issued statements warning that flights to and from the U.S. northeast have been or will likely be cancelled in the coming days. Passengers are advised to check the status of all flights. Almost 30,000 homes were without power in Ontario Monday night at around 9 p.m., according to Hydro One. Communities that faced outages included Chatham, Walkerton, Bracebridge and Huntsville. About 6,000 hydro customers in Toronto also lost power. One crew member of the Nova Scotia-built replica vessel HMS Bounty is still missing after the crew abandoned ship off the coast of North Carolina in high seas brought on by Hurricane Sandy. Fourteen people were rescued and a woman was pulled unresponsive from the ocean. She has since been pronounced dead. Fredericton's Emergency Measures Organization advised residents to keep catch basins near their homes clear of leaves and other debris to prevent localized flooding. For Toronto click on Flying debris kills woman amid Toronto storm. For Nova Scotia click on Bounty crew member found dead, captain still missing. For Ottawa click on Hurricane Sandy to bring gusting winds, rain for Ottawa area. For Windsor, Ont., click on Hurricane Sandy to affect Windsor-Essex.